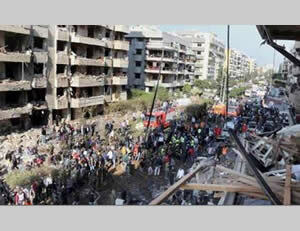 Mass-casualty double suicide bombing attack carried out at the Iranian embassy in Beirut. Mass-casualty double suicide bombing attack carried out at the Iranian embassy in Beirut. 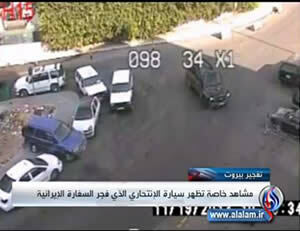 The Iranian embassy after the explosion (Al-Alam TV, Iran, November 23, 2013). 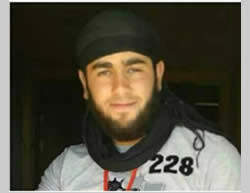 Suicide bomber Muin Abu Zaher (Bint Jbeil website, November 23, 2013). 1. On November 19, 2013, a complex, mass-casualty suicide bombing attack involving two suicide bombers was carried out at the entrance to the Iranian embassy in Lebanon, located in the southern (Shi'ite) suburb of Beirut. In our assessment, its objective was to demolish the building and harm as many embassy workers as possible. The attack killed 23 people and wounded 146. Among those killed was Ibrahim Ansari, the Iranian cultural attaché. In the days after the attack funerals were held for ten Hezbollah operatives killed in the blast, at least some of them belonging to the embassy's security staff. 2. 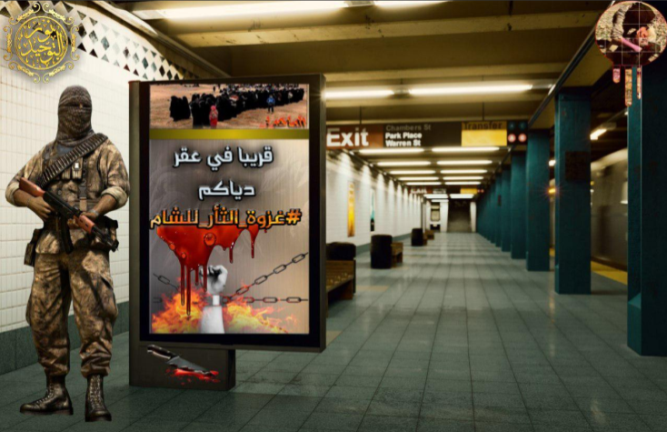 The Abdullah Azzam Brigades, a terrorist organization affiliated with Al-Qaeda and the global jihad, claimed responsibility for the attack. The Abdullah Azzam Brigades operate in Lebanon and other Middle Eastern arenas. The organization, whose Lebanese stronghold is the Eyn al-Hilweh refugee camp in south Lebanon, claimed responsibility for rocket fire into Israel's Western Galilee (October 22, 2013), which was meant to challenge Hezbollah. 3. The attack was carried out as the Syrian regime and its supporters (Iran, Hezbollah) were organizing a campaign to cleanse the region of the Qalamoun Mountains, a strategic mountain range northeast of Damascus. In Lebanon the attack on the Iranian embassy was regarded as an attempt to deflect Syrian-Iranian-Hezbollah pressure from the rebel strongholds in Syria by sending the message that global jihad networks affiliated with Al-Qaeda could strike Syria and its supporters in the Lebanese back yard. 4. The attack on the embassy was the most conspicuous "success" in a series of attacks carried out in recent months by extremist Sunni organizations, among them the Abdullah Azzam Brigades, to challenge Iran and Hezbollah. In our assessment the attack was a significant blow to Hezbollah and Iran's security and image. Using suicide bombers to drive car and motorcycle bombs is a modus operandi characteristic of the Al-Nusra Front, a branch of Al-Qaeda in Syria, which in our assessment was transferred to Lebanon and turned against Hezbollah and Iran. The method was used in Lebanon by Hezbollah as early as 1983 (the deadly suicide bombing attacks carried out by Hezbollah with Iranian support that targeted the American embassy and American and French military bases in western Beirut). Thus, thirty years later the attacks came full circle and Hezbollah, with Iranian backing, which initiated such attacks and used them to make political capital, became targets themselves. 5. In our assessment, the trickling of the Sunni-Shi'ite conflict from Syria into Lebanon and the increasing intensity of the violence between the rivals are liable to undermine even more the authority and ability to govern of the shaky Lebanese administration and lead to the growing destabilization of the Lebanese arena. The Lebanese security forces lack the operational and internal political capabilities to resist the violent struggles of skilled terrorist organizations supported by part of the Lebanese population and external powers, whether they belong to the global jihad (where they find a safe haven in the Palestinian refugee camps) or to Hezbollah (based within the Shi'ite sect in Lebanon and supported by Iran and Syria). 6. In conclusion: The double suicide bombing attack at the Iranian embassy, and the attacks that preceded it, indicate, in our assessment, the increased operational capabilities of the Abdullah Azzam Brigades and the Salafist Sunni jihadist networks operating in the Lebanese arena. Those capabilities are now being turned against Iran and Hezbollah, and may also be turned against Israel (as was manifested by the rocket fire into the western Galilee). Iran and Hezbollah, which suffered a serious blow to their security and image, can be expected to take steps against the Abdullah Azzam Brigades with regard to both security (securing important figures and facilities) and offense (retaliation against important figures and facilities affiliated with Al-Qaeda and extremist Sunni networks). All of the above may lead to a worsening of the Sunni-Shi'ite conflict in Lebanon, and possibly also beyond Lebanese borders, even as the civil war continues to rage in Syria. 7. On November 19, 2013, a double suicide bombing attack was carried out at the entrance to the Iranian embassy in Beirut. The embassy is located in the Bir Hassan neighborhood on the outskirts of the southern Shi'ite suburb of Beirut, Hezbollah's stronghold in Lebanon. According to the Lebanese and Hezbollah media, the attack began when a suicide bomber riding a motorcycle blew himself up near the barrier in front of the embassy. A few minutes later a black Chevrolet Blazer (4X4) drove up, driven by another suicide bomber. 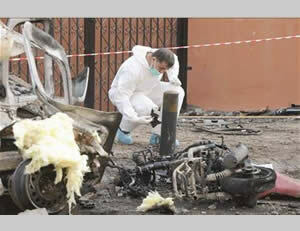 The car held a large quantity of explosives (between 50 and 100 kilograms, or between 110 and 220 pounds). Eyewitnesses interviewed by Hezbollah-affiliated Al-Mayadeen TV claimed that the first suicide bomber did not blow himself up but was shot to death by embassy security guards. 8. According to the Lebanese newspaper Al-Safir, the car used in the attack was bought in the village of Britel in the Beqa'a Valley in Lebanon. The explosives were placed in it in the region of Yabrud, in the Qalamoun Mountains. The car was then driven to Syria via the Sunni village of Arsal, in the northern Beqa'a Valley. 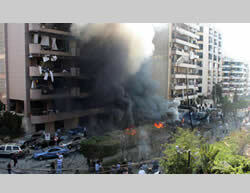 According to Lebanese "security sources," the attack was planned and orchestrated in Syria (Al-Safir, Lebanon, November 25, 2013). According to the Hezbollah-affiliated Lebanese daily newspaper Al-Akhbar, Hezbollah head Hassan Nasrallah said that the attack had been carefully planned and the planners were very familiar with the Iranian embassy. Its objective had been to destroy the section of the building near the entrance because that was where the office of the Iranian ambassador was located, which had been the target of the attack (Al-Akhbar, November 25, 2013). According to the Lebanese media, the investigation showed that this attack and previous ones in the southern suburb of Beirut had been planned by Al-Qaeda operatives in Syria, part of transferring the confrontation against Hezbollah in Lebanese territory (Al-Akhbar, November 20, 2013). 9. According to the Lebanese media, 23 people were killed in the attack, among them Ibrahim al-Ansari, the Iranian cultural attaché, and 146 were wounded. The Lebanese media also reported that al-Ansari was killed while waiting in his car for Ghadanfar Rokon Abadi, the Iranian ambassador to Lebanon (Al-Joumhouria and Al-Nahar, November 20, 2013). Hezbollah's media reported the funerals of ten Hezbollah operatives, some of whom at least, were on the embassy's security staff (See below). 10. The Lebanese media published pictures and information about the suicide bombers: both lived in the Sidon region and were supporters of anti-Hezbollah Salafist Sunni Sheikh Ahmed Asir. It was also reported that a branch of the Abdullah Azzam Brigades, which collaborates with Ahmed Asir, is active in the Eyn al-Hilweh refugee camp near Sidon (Al-Nahar, October 23, 2013). A. Muin Adnan Abu Zaher, from Sidon, a supporter of the anti-Hezbollah Salafist Sunni Sheik Ahmed al-Asir (Al-Nahar, Lebanon, November 22 and 23, 2013). Three days before the attack he wrote on his Facebook page that he intended to take revenge for the sake of Ahmed al-Asir. According to Al-Arabiya TV, he had lived in Denmark and from there went to Kuwait to work, later going to Syria and Lebanon (Al-Arabiya TV, November 23, 2013). On October 31, 2013, he contacted a friend through Facebook, writing that he planned to reach paradise before him (Alkhabarpress website, November 22, 2013). According to an article written by Sa'ad al-Hariri, the leading Sunni leader in Lebanon, the suicide bomber (who is not mentioned by name) was a young Sunni from Sidon whose mother was a Shi'ite. He who fought with "an armed group" in Syria, which had sent him to blow himself up in Lebanon (Al-Mustaqbal, November 24, 2013). According to Al-Nahar (November 25, 2013, he entered Lebanon from Syria at the Al-Masnaa' crossing with Lebanese identity papers. B. Adnan Musa al-Muhammad, of Palestinian origin, whose family lives in the village of Bissarye', south of Sidon. He worked as a mechanic. He reportedly had psychological problems (Al-Jadeed TV, November 24, 2013). For the past year he lived in Al-A'aqabia. He had been detained by Lebanese army intelligence. He had cut off relations with his family during the past year (Jibshit website, November 23, 2013). His mother condemned the attack, saying that "the religion of Muhammad does not call for suicide bombings." She said he had not known her son worshipped at the Bilal bin Rabah mosque in Eyn al-Hilweh [the mosque of Sheikh Ahmed al-Asir) or that he had belonged to al-Asir's network (Bint Jbeil website, November 23, 2013). 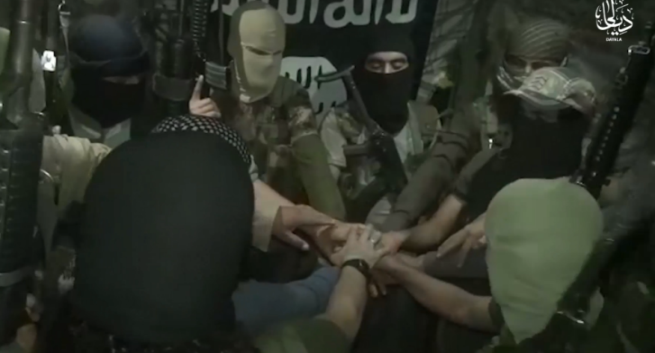 Left: Suicide bomber Adnan Musa al-Muhammad (Bint Jbeil website, November 23, 2013). 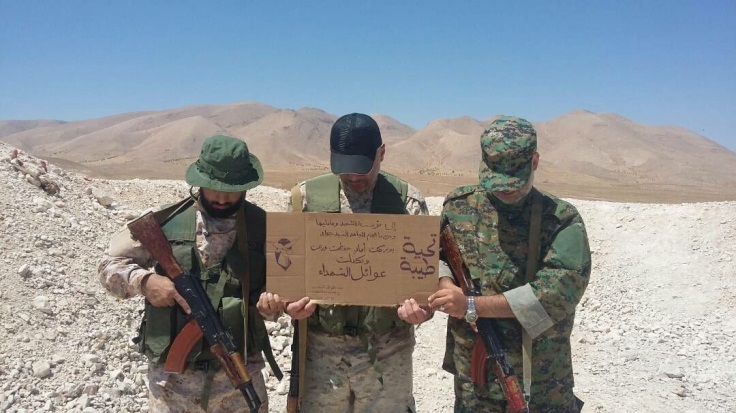 Right: Adnan Musa al-Muhammad in military uniform (Bint Jbeil website, November 24, 2013). 12. After the attack ten funerals were held in south Beirut for Hezbollah operatives who had reportedly been killed. In our assessment, at least some of them belonged to the Iranian embassy's security staff. One of them, Radwan Muhammad Fares, was in charge of security for the embassy (See picture). Another, Ahmed Zaraqat, was reportedly an embassy guard. The funerals of the Hezbollah operatives held on November 20 and 22, 2013, were massively attended. On November 20 the Iranian ambassador to Lebanon was present at a funeral (Al-Ahed, November 20 and 22; Bint Jbeil website, November 20, 2013). 13. The Lebanese Sunni Sheikh Siraj al-Din Zariqat, affiliated with the Abdullah Azzam Brigades, Tweeted on November 19, 2013, claiming that the Abdullah Azzam Brigades were behind the attack on the Iranian embassy in Beirut. He said that two Sunni shaheeds [i.e., two suicide bombers] had been killed. He said that attacks would continue in Lebanon until two demands had been met: the withdrawal of Hezbollah ("the Iranian camp") from Syria, and the release of Abdullah Azzam Brigades prisoners held in Lebanese jails. It was Sheikh Siraj al-Din Zariqat who reported on August 22, 2013, that the Abdullah Azzam Brigades were behind the launching of four rockets that targeted Haifa and other "strategic areas" in Israel. 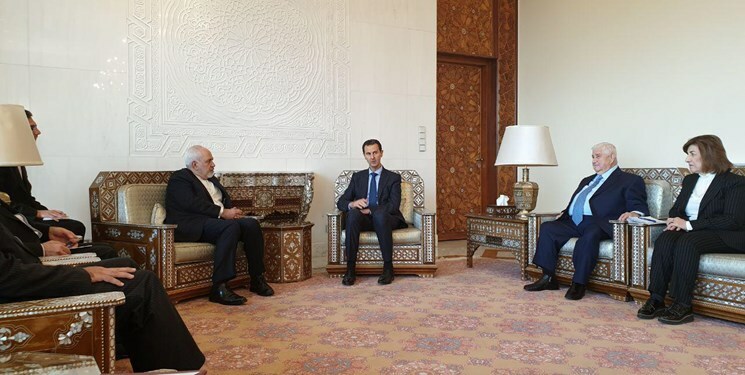 Al-Akhbar, a Lebanese newspaper affiliated with Hezbollah, reported that Sheikh Zariqat had been in Syria for more than year and that his announcements were issued from there (Al-Akhbar, November 20, 2013). 14. Iran's immediate reaction to the attack was to blame Israel. The Iranian ambassador, interviewed by Hezbollah-affiliated Al-Mayadeen TV on November 19, 2013, said that "the Zionist entity and its agents were behind the terrorist attack." On another occasion he said that "everyone" knew that the Zionist enemy supported the terrorist groups in Syria, Iraq and recently, in Lebanon (Fars News Agency quoting an interview with the Iranian ambassador with Al-Nashra TV, November 24, 2013). 15. Hezbollah later joined the Iranian ambassador in blaming Israel, but senior Hezbollah figures also accused Al-Qaeda, described as a tool in Israeli hands. Interviewed by a Lebanese radio station, Sheikh Naim Qassam, deputy secretary-general of Hezbollah, said that "these are the criminal hands of the takfirs [i.e. Al-Qaeda] and Israel, which enjoy Lebanese instability [are responsible for the attack]" (Inn.co.il website, November 21, 2013). During a ceremony held in the Lebanese village of Jibshit, Muhammad Ra'ed, head of the Hezbollah faction in the Lebanese parliament, said that the attack in Beirut was "an Israeli message sent by means of takfir [organizations]." He said its objective was not only to destroy the embassy building, but also to destabilize Lebanon and destroy its national unity (Al-Nasra, Lebanon, November 23, 2013). Nabil Qauq, deputy chairman of Hezbollah's executive council, said that the attack showed "how serious the terrorist Israeli takfir threat was to Lebanon" (Lebanese News Agency, November 24, 2013). 16. "[Anonymous] high-ranking sources in Hezbollah" related to the significance of the attack and to possible responses. The sources, interviewed by the Lebanese daily Al-Joumhouria (November 20, 2013), said that "we have entered a new, very dangerous phase, the phase of suicide bombers." They added that they were taking extraordinary measures because as far as they were concerned, everything had changed. They said they were concerned about additional suicide bombing attacks targeting facilities or Shi'ite population concentrations, "like what is happening in Iraq." They also said that Hezbollah was making a serious security effort to prevent car bombs from entering [Shi'ite population concentrations], but "it is hard to cope with suicide bombing attacks." On November 20, 2013, Al-Joumhouria reported that the Hezbollah leadership had held high-level security consultations, where it had been recommended that the organization's offices, houses and headquarters "take exceptional measures" to protect themselves from suicide bombing attacks. 17. Two days after the attack the Saudi Arabian embassy in Lebanon called on Saudi citizens to leave Lebanon and take security precautions (AP, November 21, 2013). The call came after items appeared in the Lebanese media and social networks baselessly accusing Saudi Arabia of involvement in the attack. One of them was an aerial photograph of the Saudi Arabian embassy labeled "Saudi embassy in Lebanon, only serious [people] need apply" (Al-Quds Al-Arabi, November 21, 2013). 18. Particularly threatening was a column entitled "A gift from the [Saudi Arabian] kingdom to Iran," by Ibrahim al-Amin, editor of the Hezbollah-affiliated Lebanese daily newspaper Al-Akhbar. It accused Saudi Arabia of responsibility for the terrorist attack in Lebanon (Al-Akhbar, November 20, 2013). According to the column, "no one expected the kingdom of oppression [i.e., Saudi Arabia] would rush to move the battle to a new stage, including an attempt to copy Iraqi suicide bombing attacks in Lebanon." It also stated that the fighting in Syria would not be influenced by suicide bombing attacks in Lebanon, and hinted that the campaign might be extended to other countries in the Saudi camp, such as Yemen and Bahrain. It added that Hezbollah, along with the Lebanese security services, had prevented many terrorist attacks in Lebanon but beginning a series of suicide bombing attacks would force them to "take preemptive deterrent actions." The column ended by saying that "the global front to destroy the Arab East" [i.e., Saudi Arabia and its allies] had decided to enter into a war of blood against Iran and that what could be expected were "additional waves of insanity in the form of red royal [Saudi] gifts." However, Iran had its own methods and its own deterrent capabilities, and could cope with the attacks, it said. 19. The attack on the Iranian embassy was a peak in the wave of varied attacks carried out in Lebanon in recent months targeting Hezbollah and Shi'ite population concentrations. In our assessment some of them were carried out by Salafist Sunni networks in Lebanon, and some by the Abdullah Azzam Brigades and other organizations affiliated with the global jihad. So far Hezbollah has failed to curb the attacks, which illustrate how the Syrian civil war has trickled into Lebanon, and how its Shi'ite-Sunni confrontation has entered the Lebanese arena. The attack on the Iranian embassy may indicate a worsening in the confrontation in the Lebanese arena and possibly elsewhere as well. 20. There were two serious car bomb attacks in the southern suburb of Beirut, which is a Hezbollah stronghold. A. On July 9, 2013, a car bomb exploded in a parking lot the Bir al-Abd neighborhood in the southern suburb of Beirut, killing a number of people and wounding several hundred. No organization claimed responsibility for the attack. B. On August 15, 2013, a car bomb exploded in the southern suburb of Beirut between the Bir al-Abed and Al-Rawis neighborhoods, killing 25 people and wounding hundreds. No organization claimed responsibility for the attack. 21. In Lebanon in general and within the ranks of Hezbollah in particular, there is a fear that the wave of attacks initiated by organizations affiliated with Al-Qaeda will continue. The Lebanese media reported that on November 22, 2013, the Lebanese army identified a car bomb in the northern part of the Beqa'a Valley, which is controlled by Hezbollah. According to media reports, the vehicle was identified by Lebanese army soldiers (according to a different account, by Hezbollah) as it was en route from Syria to Lebanon (in the region of Arsal). As the soldiers chased the car its passengers opened fire on them. After an exchange of fire, the vehicle was captured and found to be carrying between 400 and 500 kilograms of TNT, or between 880 and 1100 pounds, and two mortar shells. The Lebanese army closed off the area, evacuated residents, neutralized the explosives and opened an investigation. The vehicle's passengers managed to escape (Alhayat.com website and Al-Joumhouria, November 25; Lebanonfiles website, November 23, 2013). According to a different version, the suicide bomber was on foot, but photographs of the remains of the motorcycle support that version. On November 24, 2013, the Palestinian Authority (PA) condemned the attack against the Iranian embassy, saying that the participation of a Palestinian "in a criminal act" was an individual attack serving only the enemies of the Palestinian cause. The PA expressed its condolences to the families of the victims and said it stood side-by-side with Lebanon (Wafa News Agency, November 24, 2013). In addition to ten operatives in the attack in Beirut, Hezbollah also recently had losses in Syria. On November 20, 2013, the Lebanon 24 website, quoting "Lebanese sources" reported that an estimated ten Hezbollah operatives had been killed in the area around Damascus during the previous days, and that the organization would bury them in their places of residence in the Beqa'a Valley and south Lebanon. Hezbollah calls groups affiliated with Al-Qaeda "takfir groups," i.e., groups which declare a Muslim individual or group to be infidel because they do not adopt radical Islam (which gives them legitimacy to attack the individual or group).